Armitage became a passionate advocate of braille, pressing for its adoption at discussions on a unified type at the International Congress for the Blind, Paris (1878), and using it for his own correspondence and journal. By 1883, 27 British institutions reported using the system, although Moon was still more popular at this point. One of braille’s advantages was the ease with which it could be both stereotype-plated for mass printing and hand written by blind and visually-impaired people using simple writing frames, whereby each individual braille dot is ‘pricked out’ with a stylus worked from right to left, so that pushed out braille dots can be read on the reverse of the paper: each braille cell must also be entered in reverse. The writing frame consists of two parts, an oblong wooden base and a brass 35 braille cell writing frame. The wooden base has five equally spaced holes running up both the left and right hand sides. The writing frame is positioned over the second from bottom hole. The writing frame consists of two plates – a bottom plate with small depressions for each braille dot and a top plate with holes cut out in it in the shape of braille cell. The writing frame overlaps the wooden base by about one centimetre on either side. Each end of the writing frame are brass clamping screws which enable the paper to be put through and held into place. A label is fixed above the bar, with the text ‘Exhibition of the Arts and Industries of the Blind’, 1914. 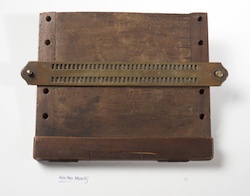 Class C. Braille Writing frame used by Dr T. R. Armitage, lent by Alice S. Armitage.